A waiter’s view from the restaurant at the top of the White Horse hotel. 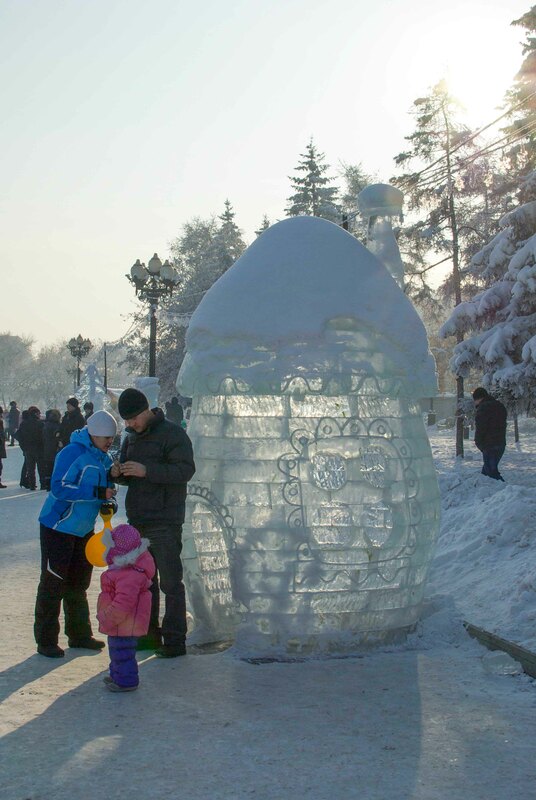 Ulan-Ude in Winter’s grip. This post is dedicated to Christy Morgan, a great friend, with a lovely smile who braved a new culture and a coooooold winter to love on Siberians. She is getting married to her Jonathon this very fine day in Florida. Yahoo! And wishing you both our very best. Ever wonder what the view looks like out someone’s window on the other side of our bantam blue planet? What some Indian businessman gazes upon as he contemplatively buttons his shirt in the warmth of a Bangalore summer morning? What a Chinese child might spy out her autumn Kunming window after her studies? What frosty winter view stretches before a Siberian wife sipping darjeeling tea? Oh! To find common ground with a Mechanic from Davao or Cleric from Alexandria observing life outside their window. To meet some deep human need of understanding in a shared, silent gaze at life through glass. Window views from Bangalore, Alexandria, Davao or Kunming I can’t do. But if you have longed for a view on Ulan-Ude from someone’s window, come stand next to me, and let’s see what we can see. Watching the police cruise Kluchevskaya street in the gloaming. A neighborhood maintenance worker chips away packed snow encrusting the driveway under our apartment building. 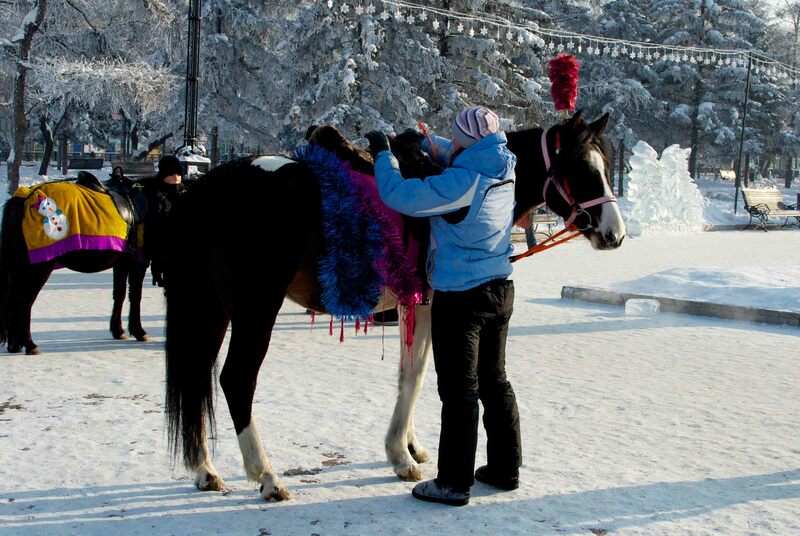 Ulan-Ude, capital of the Buryat Republic, snuggles between hills sheathed in Siberian pine, marches toward the banks of the Selenga river and spills across her current out onto the sprawling steppe. It has changed drastically since I first visited this fair settlement of former nomads in January of 1999. I remember searching the whole east side in vain for a place to eat; now there are cafes on every other block across the city. 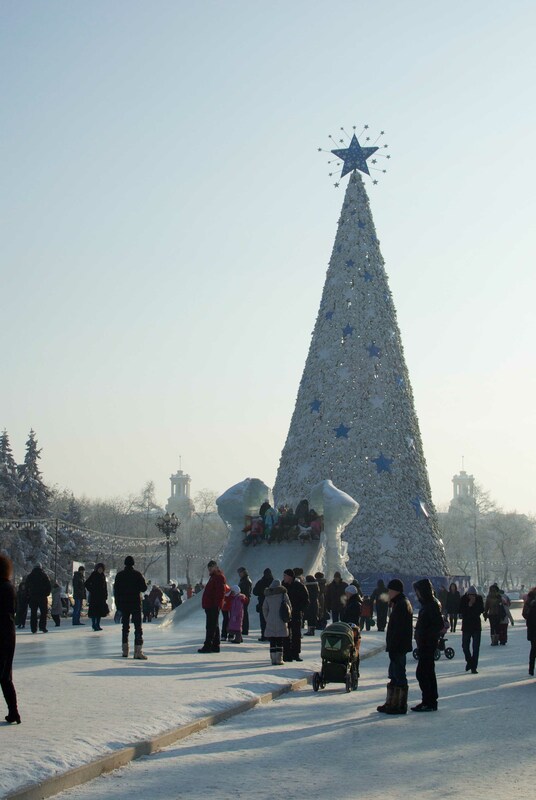 Fourteen years ago there was one shopping center, the Univermag (Universal Shop) on Lenin Street. Now swank shopping centers spring up from under your feet. The city has become a real patron of the arts, planting sculptures of nomadic archers, warriors, maidens, birds and beasts liberally upon her squares and bridges. The administrative building for the Railroad region of the city on Oktoberskaya, lit Las Vegas style. Generally though, art is not what you see out your window. Rather, you see white ten-story prefab apartment buildings, or five-story versions in weathered shades of amber, pumpkin and brick. 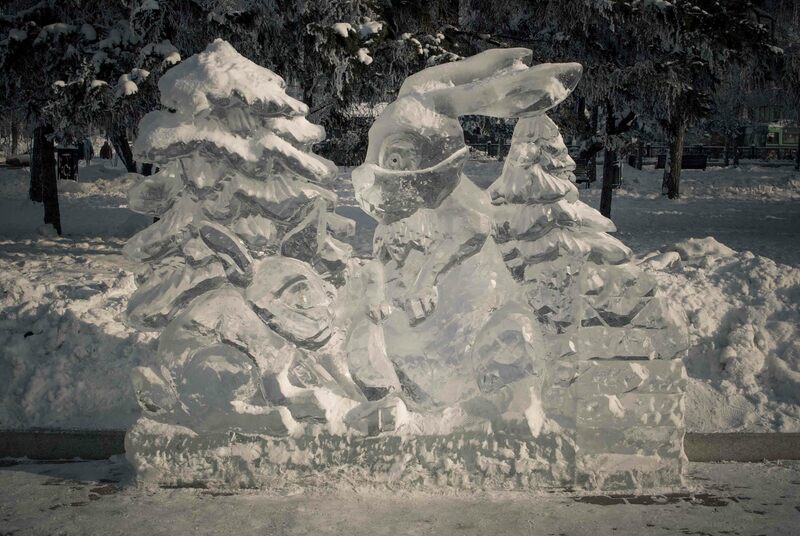 You might see people chopping wood, walking their house dogs, upbraiding itinerant packs of feral dogs, hauling water from public water pumps, shopping, strolling, sledding, chilling in land cruisers, waiting for trams, picking through trash bins, or just chatting. The neighborhood grandma’s gather for a winter’s chat. Named “The Pentagon”, this brick apartment building has a commanding perch on Ulan-Ude. Yes, the edifice is more circular in shape. Trees near your window are a boon indeed, as they cater to feathered flutterers who visit your windows unannounced. I am unfamiliar with many bird species here, and so don’t know their equivalent names in English. A few favorite visitors I do know, such as Great Titmice, Azure-Winged Magpies and Bohemian Waxwings. These Waxwings seem to show up on schedule right around noon at our kitchen window. Puffed up against the Siberian cold, they look like a ball of down fluff with a beak. As it turns out their are three species of the Waxwing: Bohemian, Cedar, and Japanese. I have always been mystified as to why these birds are called “Waxwing”. The etymology of the English name of the bird is fascinating. Waxwings have brilliant red tips of “wax” on the inside, or secondary feathers of their wings. The red reminded people of red wax used for sealing letters, hence the name Waxwing! Bohemian is a reference to gypsies or Roma from the East who are known to wander throughout Europe, and Asia. To English speakers, Bohemia used to be known as a place “somewhere far to the east”. Perhaps they should be renamed Siberian Waxwings, as Siberia is much farther East than Bohemia and the Roma roam here still. These little aptly named wanderers continue in the traditional nomadic culture of much of the East, handed down to them by their fore-bird-fathers. This Bohemian Waxwing takes a break from his lunch break. What’s at the bottom of this blue fence? Growing up in a railroad town, I have always wondered at diesel dragons appearing from nowhere to roar through town, stopping people in their tracks, kicking up a hub-bub and then disappearing, leaving peace in their wake. In Irkutsk, I lived in a region called Universitetski (University) where I could see the great Trans-Siberian beast rumble through the city. When I walked to Russian class I crossed the railroad. Yes, more than once I stopped to squish a few rubles under the steel wheels of the dragon. While we can’t see the Trans-Siberian railway from our flat, we have friends who can. Behold a frosty afternoon vista from their window, through the smoke of a thousand fires keeping the cold at bay one more night. Looking west over the Trans-Siberian Railway toward the left bank of the Selenga. The people of Sovietski region stoke their stoves against the approach of a frigid eve. 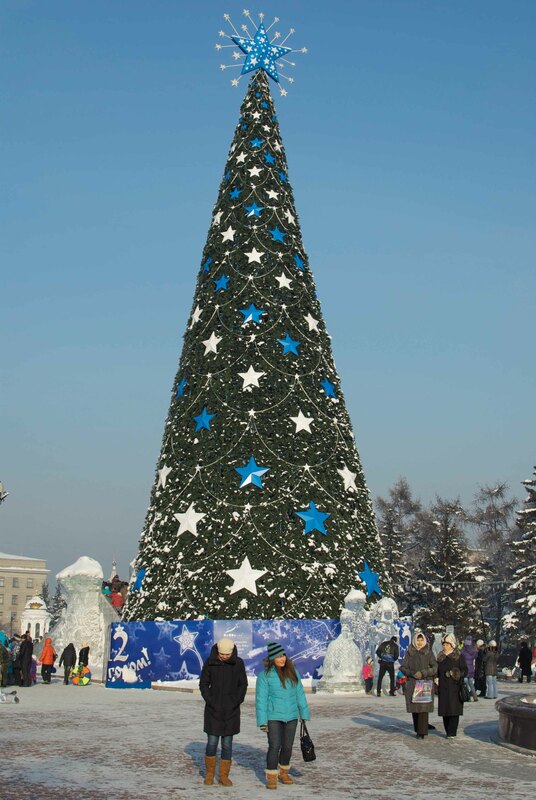 The center piece of any ice city in Russia is, of course, the Yolka – a Christmas Tree. They used to have an actual fur tree back in the day. Now it’s just a metal construction covered with plastic fur tree branches. But it still brings cheer to the young and old alike. 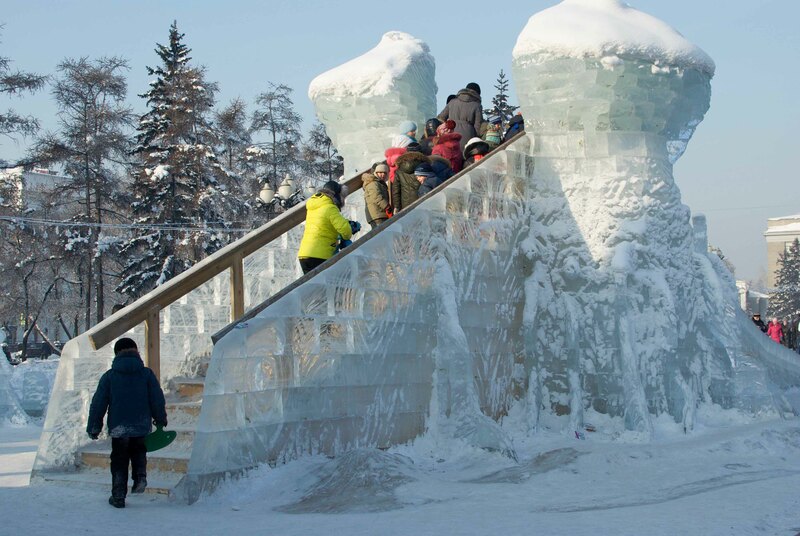 The most important attraction of any ice city is an ice slide. The bigger, the better, of course! Queuing up in the back of the ice slide. 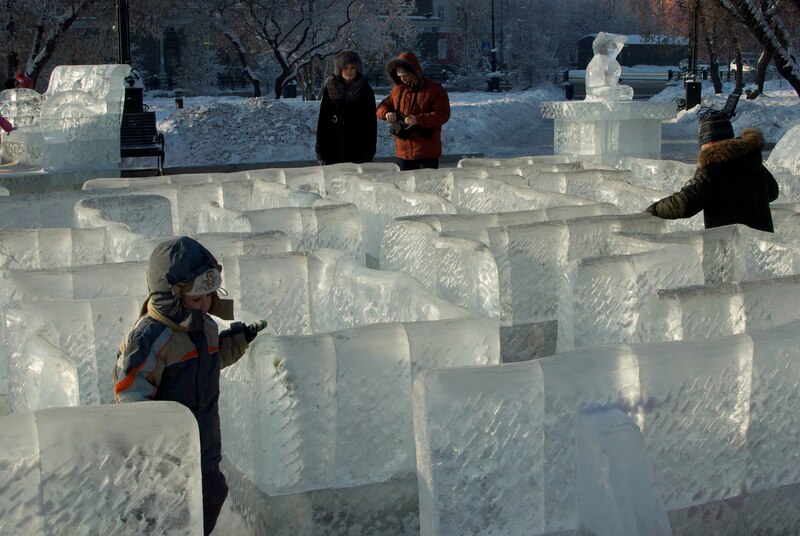 The ice was harvested right here in Irkutsk. 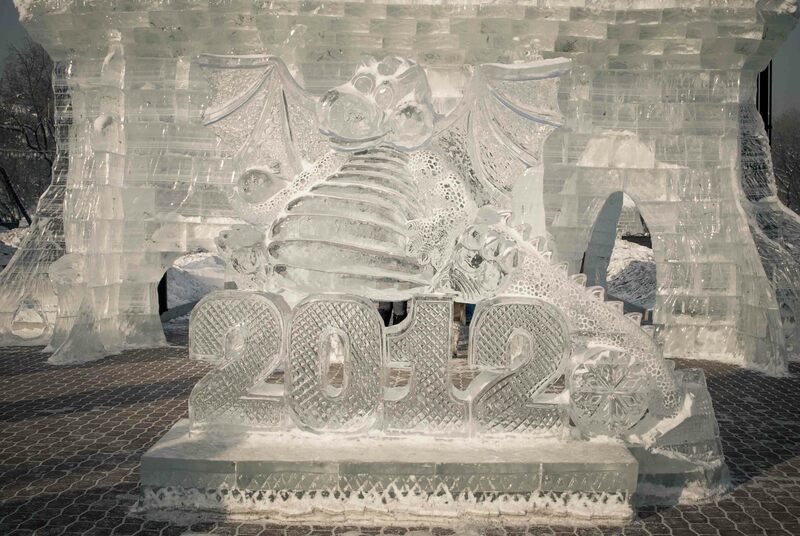 You can see pieces of lake plants in some of the sculptures. 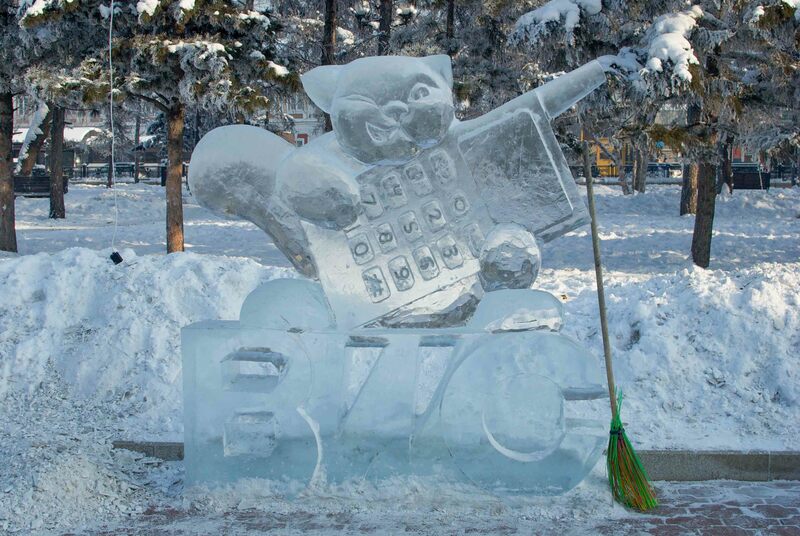 This pugnacious squirrel with a cell phone from the 1990's is advertising Baikal West Com, a cell phone service provider in Irkutsk. Many thanks, BWC! 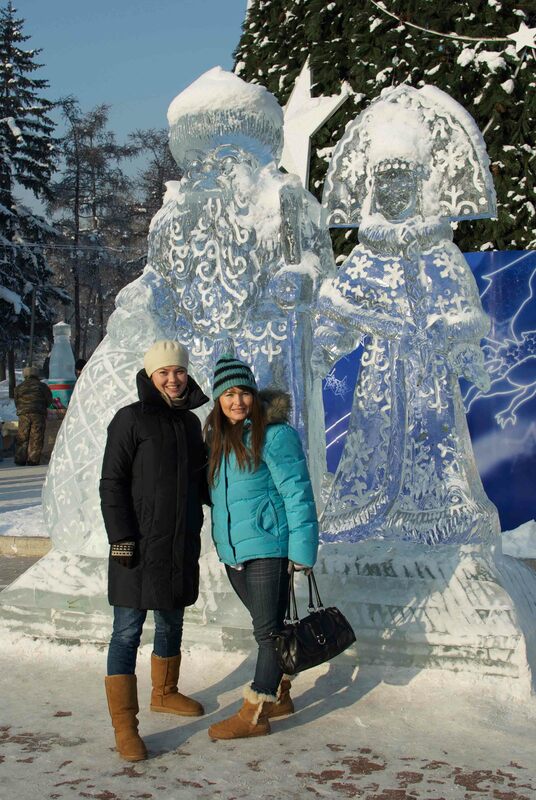 My friendettes, Tanya and Vica, posed for me in this -8 F weather. 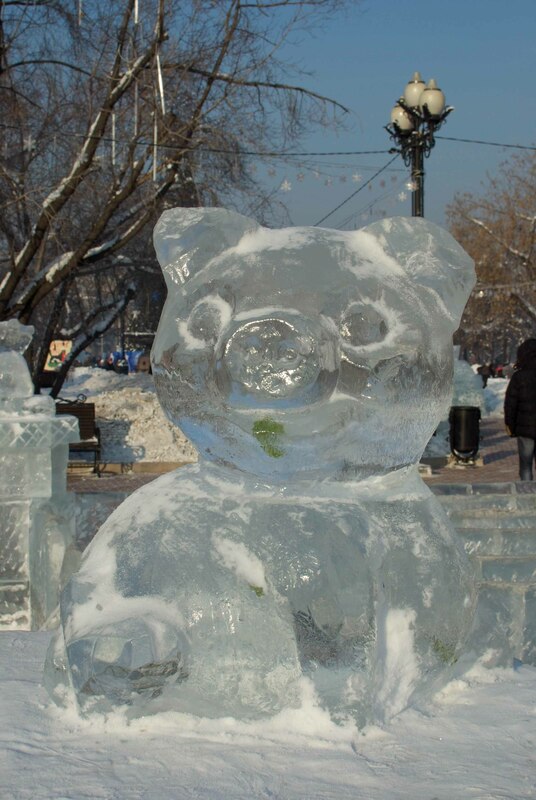 I hope you enjoyed this taste of winter in Siberia! 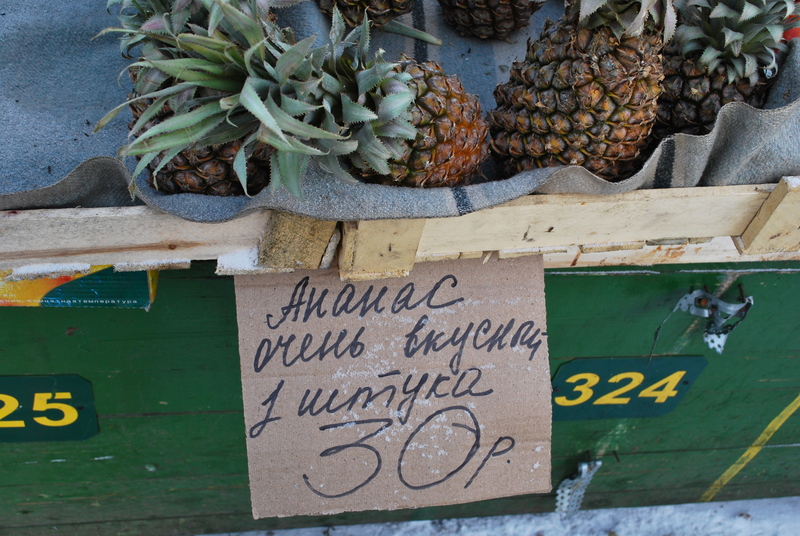 The sign says: "Pineapple, very tasty, 30 rubles each". 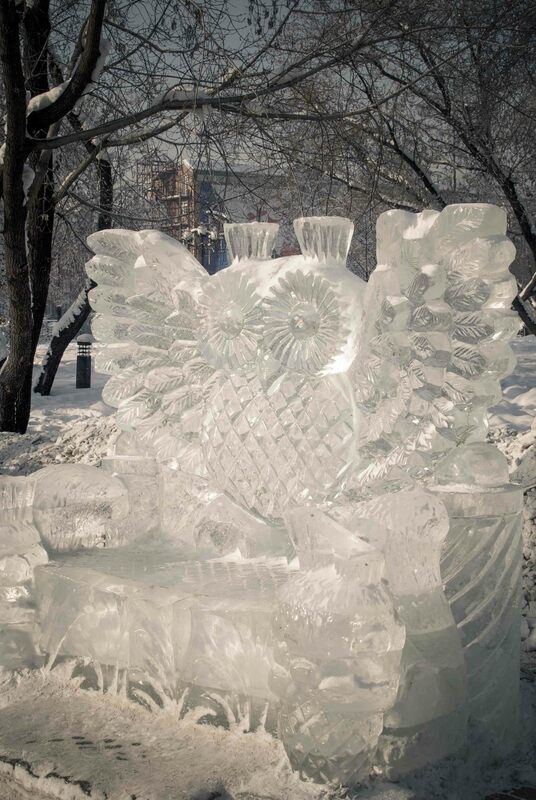 With temperatures hovering well south of zero, street vendors find creative ways to sell their products. 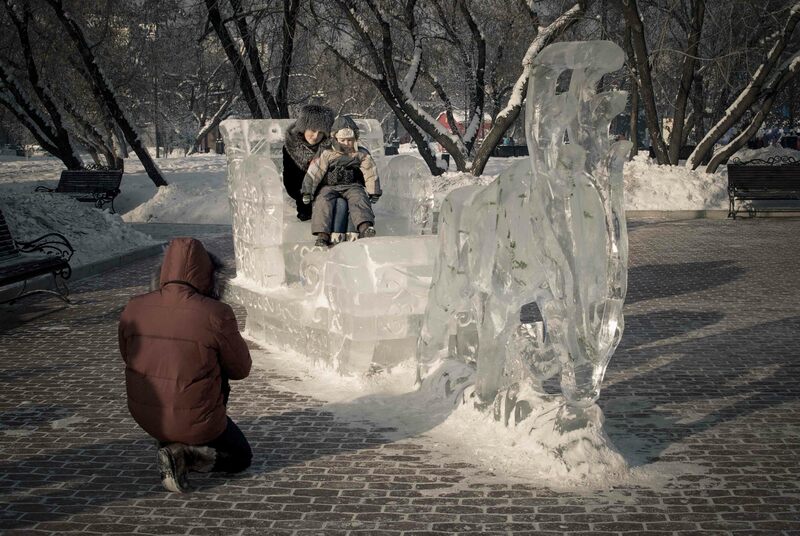 While most of us would be home shivering under a blanket, Siberians put on fur and go about their business. If you sell produce outside, you take some hot tea, and you stand in the cold all day! 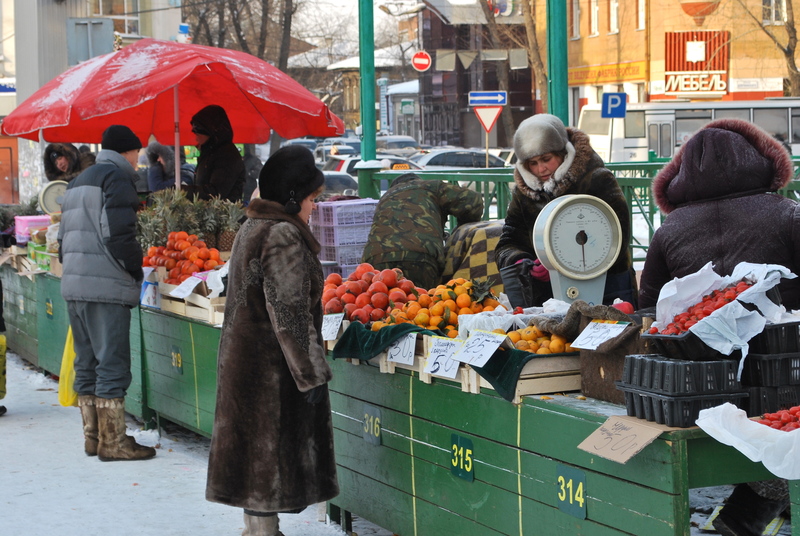 Fruit vendors bundled against the frost. Note both customers are wearing reindeer hide boots. Now I’ve seen frozen fruit, vegetables, fish, and meat all unpackaged hunks of ice waiting to be chunked into any bag you’ve got handy, but yesterday was the first time I’ve encountered frozen pineapple for sale! Frozen pineapples lined up at a booth was too much for me, I broke into laughter! Noting my interest, the sales lady leveled her considerable business acumen at me with a “how many are you going to buy?” At a dollar a piece, how could I refuse? I did however refuse her offer on frozen kiwi. 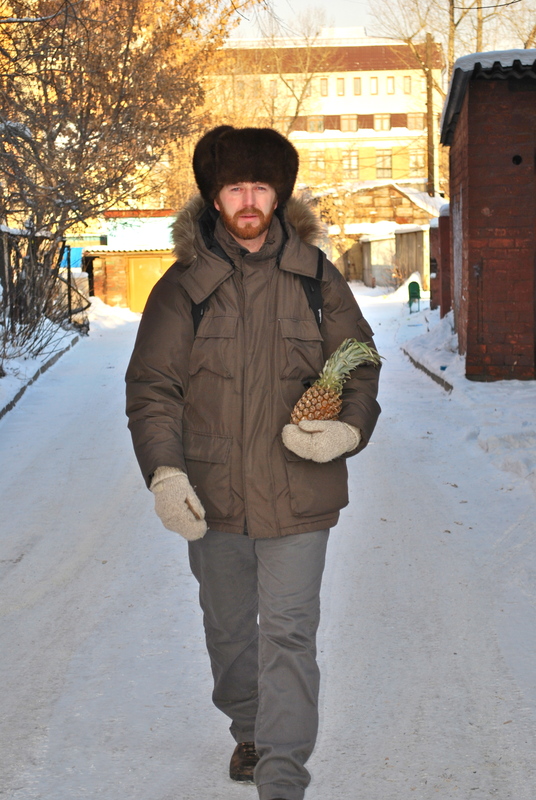 I don’t think my body could handle the right-left combination of pineapple-kiwi in Siberia. I paid up and stashed my prize in a backpack. 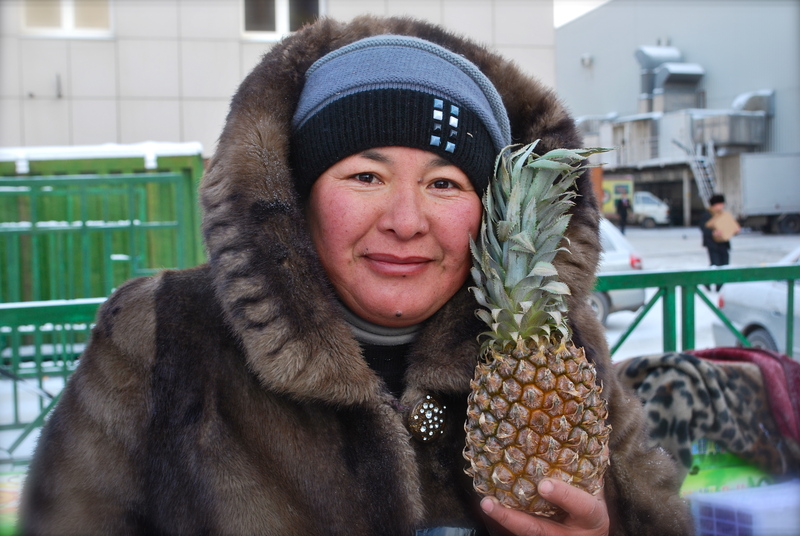 A cheery lady selling loverly frozen tropical pineapples. Later Yulia and I staged an impromptu photo session to express the joy of discovery. Look for a photo exhibit coming soon to your town, entitled: “Stranger in a Strange Land”. A whiff of the sweet stranger. A "Resevoir Dogsesque" saunter. I know, the pineapple makes me look TOUGH! "Look! 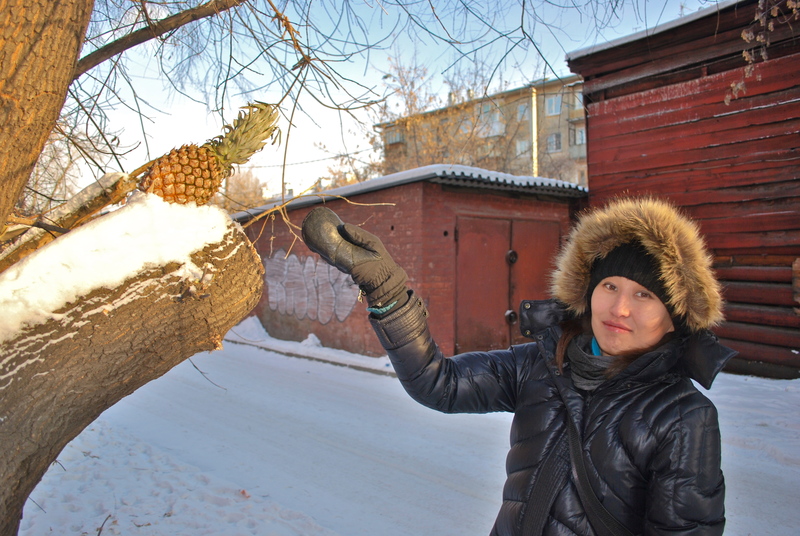 Siberian pineapples do grow on trees!"